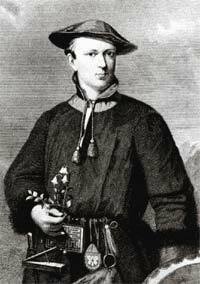 Linnaeus in a Sami costume. Painting by Martin Hoffman 1737 in Holland.Photo: S. Hallgren. In Linnaeus’ day little was known about Lapland. People even thought that the lemmings found there could be so many because they fell from the clouds like rain. Moreover the Swedish economy was poor. Perhaps there were hidden natural riches in Lapland? The Royal Society of Sciences at Uppsala understood that Linnaeus was a widely knowledgeable natural scientist who would be suitable to send to explore Lapland’s secrets. Linnaeus set out on the 12th May, 1732. When he returned on the 10th October of that year he had much to tell and to show. Linnaeus had travelled on horseback, on foot and by boat through Swedish, Norwegian and Finnish Lapland. Linnaeus had endured hunger, cold, the attacks of mosquitoes, been near death when a large rock fell close by and had nearly been shot by a Laplander (or Sami as we say today). On the other hand he found so many plants that he could compile a flora of Lapland. He had studied the lives of the Sami and was impressed by their friendliness and healthy life. He had seen the midnight sun and learned to recognize different minerals. He had noted down all he saw and even sketched everything from a Northern Hawk Owl to Sami women at their handicrafts. When he returned to Uppsala he brought with him a Sami costume and a magical drum. Later, when he narrated his adventures he sometimes dressed up as a Sami. To Linnaeus from Småland in southern Sweden a reindeer was an exotic animal. Coming to Lapland, Linnaeus felt, was like coming to a new world. After his expedition to Lapland Linnaeus felt disappointed at how little people cared about his discoveries and, above all, his extra expenses. Later it has been said that Linnaeus’ expedition to Lapland was the most important scientific expedition so far in Sweden.